I spent the night in a local guesthouse in Selcuk so that I would be ready to visit first thing in the morning and then didn’t have to travel far to get home. 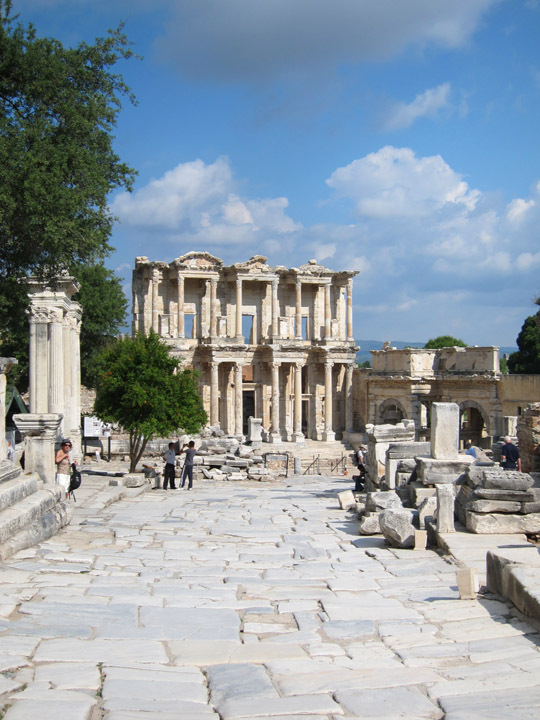 Ephesus is a UNESCO World Heritage site and a fantastically complete ancient Roman city. I had left the entire day open to explore and was definitely not going to worry about how long I stayed! Arriving at 9am, there were only a handful of independent tourists. Given the sheer size of the city, it felt like I had it all to myself. 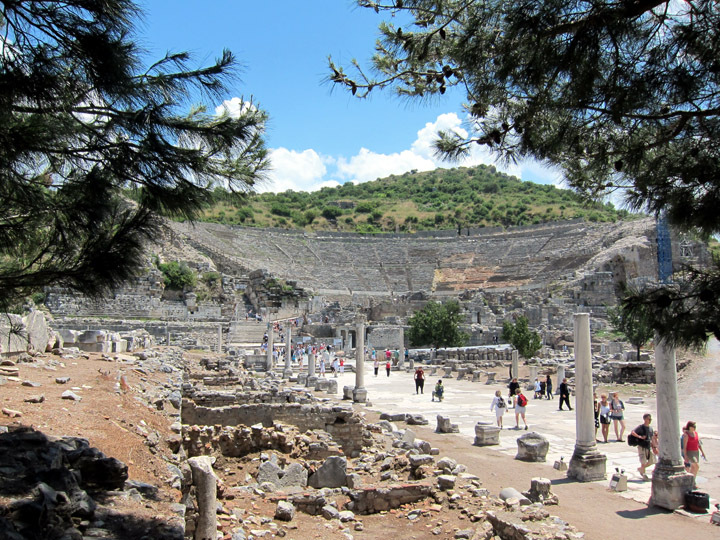 While conventional wisdom says you have to start at the upper entrance to Ephesus, the elevation through the site is fairly moderate so ignore the cabbies interested in taking you to the top and start from bottom entrance. Empty roads and perfect morning light in Ephesus. Definitely take advantage of the morning light to get your “postcard photos” but remember to take some time to soak in the gleaming white marble structures and the elegant but massive road through town. You have all day to explore the little spaces and artistic details so enjoy the sweeping views first. Because the crowds will arrive! Starting in earnest around 10:30am, the buses drop off in the upper city and then lead their groups down. Between trips to the restrooms (by the lower town entrance), we noted the same groups from the top and estimated they were only spending 1-1.5 hours on site! For comparison, having packed in lunch and water, I was in Ephesus for 6 hours! 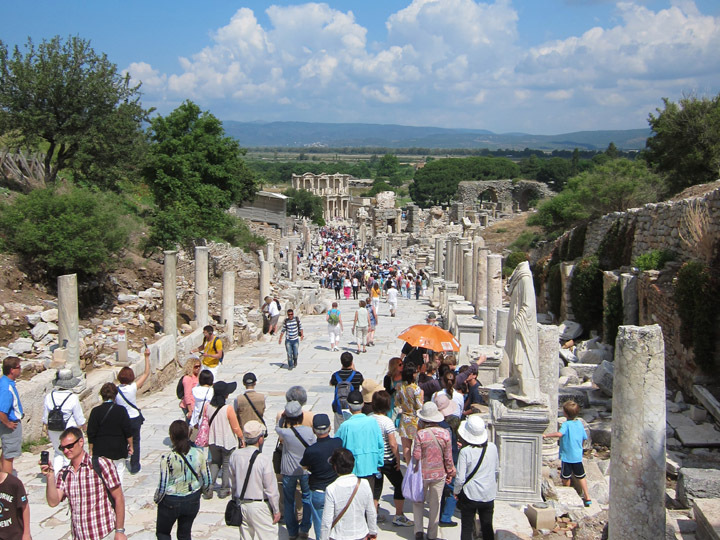 Mid-day Ephesus is overrun with day-trippers and cruise ship passengers. While it makes movement through the city difficult and slow, the visitors are a nice reminder of how bustling this ancient town once was. 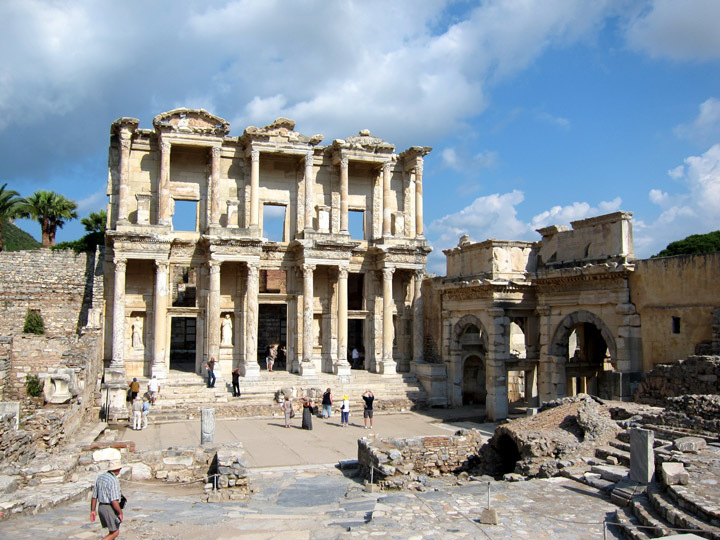 Ephesus was a popular trading port and a later Roman provincial capital. Of course, if it gets to be too much, you can always take refuge in the Terrace Houses. An often missed side attraction, the frescoes are gorgeous. 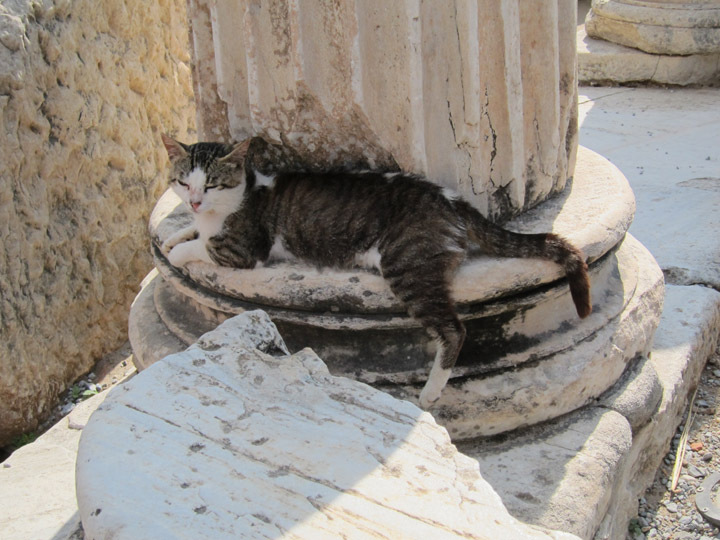 Take a tip from the Ephesus cats – enjoy the shade and don’t rush! Otherwise, just sit back and let the crowds pass. Within 10 minutes most visitors move on. And then you can get back to enjoying the completeness of the architecture, the artistic detail and the cityscape. 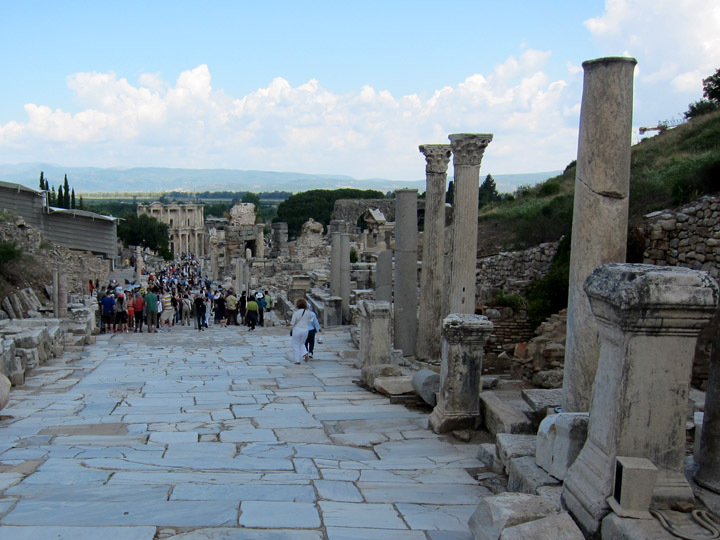 Quite returns to the lovely ancient paved streets of Ephesus. 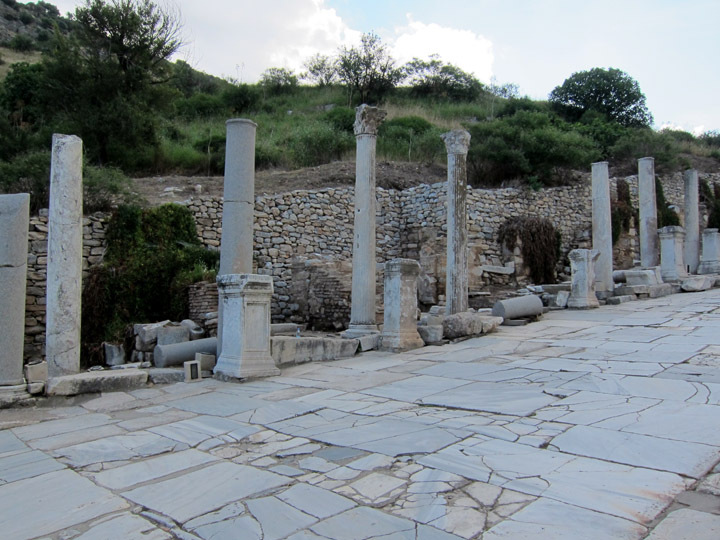 Christina, Ephesus looks fantastic. Your mode of travel is our preferred approach too when we’re lucky enough to have the luxury of time! (We spent two days at Petra and could’ve explored much longer…) How much time did you spend in Turkey? I’ve only been to Istanbul, but would love to explore more of the country? Thanks Tricia! We were in Turkey for 2 weeks and traveled from Istanbul to Bodrum along the Western coast. I can think of about 4 more trips I want to make to Turkey; there is so much to see! We rented a car and drove ourselves. I think it was a little worse than Greece if you can use that as a frame of reference. It was worth it at least for the independence you get from having a car and being able to explore at will. I of course have to credit my husband who does all the driving. I am the master navigator!